While S'Mores are traditional bonfire fare, these STUFFED GRILLED BANANAS are a somewhat healthier and very unique alternative. A little advance thought into choosing your favorite toppings and fillings and having them on hand will make this your "go to" dessert for an evening by the fire with friends and family. Add to the deliciousness, the fact that there are no dishes or clean up...and that's my kind of food. It's been a long time addition to our bonfires at Hidden Valley cause we never know how many will show up and you can always use leftover bananas so there's no waste. Put together some topping ideas: peanut butter, chocolate or toffee chips or broken chocolate bar bits, coconut, nuts, berries, mini marshmallows or caramel bits. Have enough bananas for one banana per person. I promise they won't want to share. 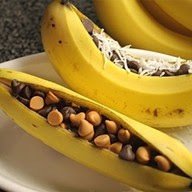 Slit the bananas in half lengthwise, but be careful not to cut all the way through to the bottom. Spread apart the peel a bit and stuff full of the toppings. 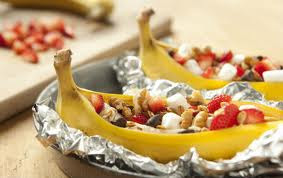 Place on a foil lined grill for about 5 minutes, or until the bananas are heated and the toppings are softened and melty. Alternatively, you can wrap it in the foil with the top slightly open and lay it safely on a side portion of a fire pit. We've even done them on a marshmallow roasting fork. With this method I like to roast it alone over the fire first then after the skin turns a little dark (a couple minutes) remove fork from the fire, slit fruit in half, adding the toppings. They melt almost immediately but a few extra seconds of roasting over the fire will finish the job. With kids among us, the final roasting can be foregone in the interest of not losing your fruit in the fire with all those luscious toppings. Grab a spoon and scoop away. Keep this a secret but I'm not above sticking one of these in the microwave, no foil of course.